IPv6 basics such as understanding IPv6 addressing are covered in the A+ Exam. This Q&A with “CompTIA A+ 220-701 and 220-702 Exam Cram” book author David Prowse will answer what you should know about IPv6 and its security benefits. Covered in theCompTIA A+ Exam are some IPv6 basics that are essential for any computer support technician or networking professional just getting into the field. While his book, CompTIA A+ 220-701 and 220-702 Exam Cram, only goes over the basics of IPv6, in this Q&A, author David Prowse provided us with some important information to know about IPv6 addressing for those new to IPv6 basics. 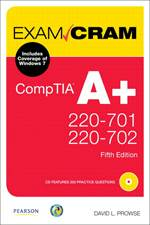 You cover some IPv6 basics in the Networking chapter of your book, CompTIA A+ 220-701 and 220-702 Exam Cram. You talk about how to configure an IPv4 address; can you explain how configuring an IPv4 address differs from configuring an IPv6 address? David Prowse: Generally IPv4 and IPv6 addresses are configured automatically on the client side. But on a server or on another networking device, you’ll probably want to configure those manually. If you’re working in Windows, IPv6 can be configured in the GUI in mostly the same manner as IPv4. You go into your local area connections properties window, or dialog box, and the IPv6 option will be right next to the IPv4 option. The difference is going to be the type of address you type in, of course. This is going to all depend on what your company is using, but if you’re going to use IPv6 then you’re going to have a much longer address. Now in the Command Line you can also configure IPv4 and IPv6 addresses. Also, in Windows for example you can use the Netsh command. It’s just that the syntax is going to be a little bit different when configuring a v4 address compared to the v6 address. How much does the A+ exam cover IPv6 basics, and how is that relative to how much the average working IT professional would need to know about understanding IPv6 addressing? Prowse: The A+ exam objectives really only go into the basics of IPv6. You need to know what IPv6 is, why it is being used, why it is slowly being introduced into networks and how it can be better than IPv4. You also need to know the IPv6 structure as far as the actual addresses and what parts make up the address. You should also know how to configure an IPv6 address in the GUI. I was mentioning the net shell command before, that’s getting a little bit beyond the scope of the A+ objectives, but its great information to know if you want to learn how to do that. But generally that kind of stuff is covered more in the Network+ objectives. As for the second part of your question, you mentioned how much does the professional need to know about IPv6. The objectives for the exam, they really only cover the basics of IPv6. But the professional in the field definitely needs to know more, and will probably have gone for additional certifications for understanding IPv6 addressing as well, such as the Network+. But the professional should really know how to configure IPv6 addresses in the Command Line in both Windows and Linux and UNIX environments, and also how to configure them in the GUI. They should also know the different versions of IPv6 addresses that are out there, local addresses and public addresses, and really be able to work with those addresses and troubleshoot those addresses. How many IPv6 addresses are there? Understand the number of IPv6 addresses available in the new protocol of the Internet. What are the benefits of IPv6, other than the capacity for more addresses as well as larger packet sizes? Prowse: Those are the main benefits; the basic IPv6 benefit is the capacity for more addresses. But IPv6 can be more secure than IPv4. It also simplifies address assignment and network numbering. But generally, the biggest benefit is going to be that capacity for more addresses. You're talking about 2 to the 128th power addresses, which is far beyond what IPv4 offers. When the final move toward IPv6 does happen, will IP addresses that are on IPv4 transfer over to a new IPv6 address? Prowse: We need to keep in mind that IPv6 has been in use for a decade, it’s just slowly growing over time, and also that the “switch” so to speak isn’t going to happen overnight; it’s going to continue to gracefully switch over. Even though the US government is trying to really push corporations to IPv6, I think it’ll still be a slow transfer. But IP addresses that are on an IPv4 network can, right now, transfer over to IPv6 addresses. Generally you’re going to be doing this with some type of tunneling software, for example Teredo software. IPv4 addresses can be incorporated directly into IPv6 addresses right now, and most operating systems have the software that’ll allow you to do this. Now, a lot of people at home only have IPv4 connections to the Internet and that’ll require a person to make the change over from IPv4 to IPv6 if they want to connect to an IPv6 server. So, that’s also done with software, so you can actually tunnel through. The switch will definitely be slow and it’s definitely not something that’s going to happen overnight. To learn more about IPv6 migration, view this guide. When we were talking about the more WAN networking specific questions from CompTIA A+ 220-701 and 220-702 Exam Cram, you mentioned IPsec. Now, what enhanced security benefits does IPsec offer WANs in the IPv6 class? Prowse: IPsec is going to encrypt the data within the packets for IPv6, which IPv4 doesn’t do by default. You can encrypt the data in IPv4, but IPv6 has this as mandatory. I don’t know if it’s an enhancement, so to speak because some people already use these types of security benefits with IPv4, but now it’s definitely mandatory in IPv6. You can learn more about IPv6 security in this tip. ⇒ For more information, get IPv6 explained to fully understand the latest Internet Protocol.